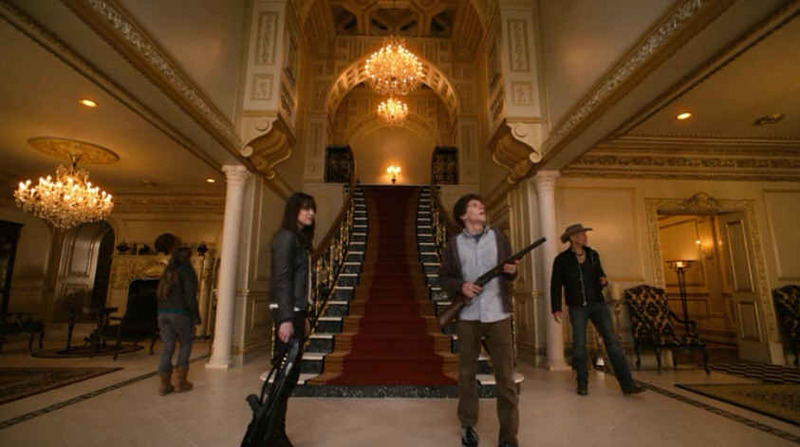 For Sale: Bill Murray's Hollywood Mansion in "Zombieland"
Bill Murray’s Hollywood mansion in the horror-comedy movie Zombieland is on the market for $19.9 million. It’s not really Bill Murray’s house, of course, and it’s not really in Hollywood. 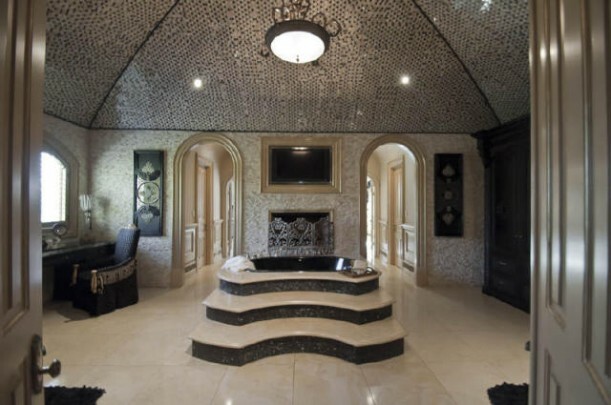 It sits on over 2 acres in Atlanta, Georgia, and belongs to real estate developer Lee Najjar (aka Kim Zolciak’s ex, “Big Poppa”). Take a look! In the movie, zombies have taken over, and Jesse Eisenberg joins forces with a group of quirky characters played by Woody Harrelson, Emma Stone, and Abigail Breslin, to fight for survival. In Hollywood, they use a map of stars’ homes to find Bill Murray’s residence and decide to crash there. 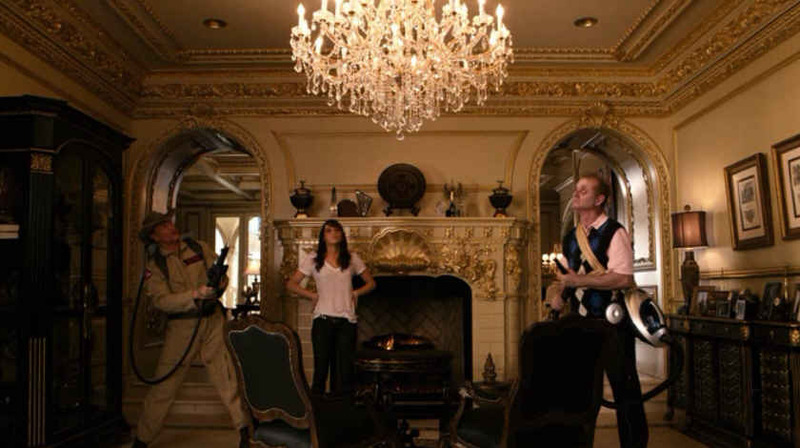 They actually filmed this part of the movie on location, in the mansion in Atlanta. 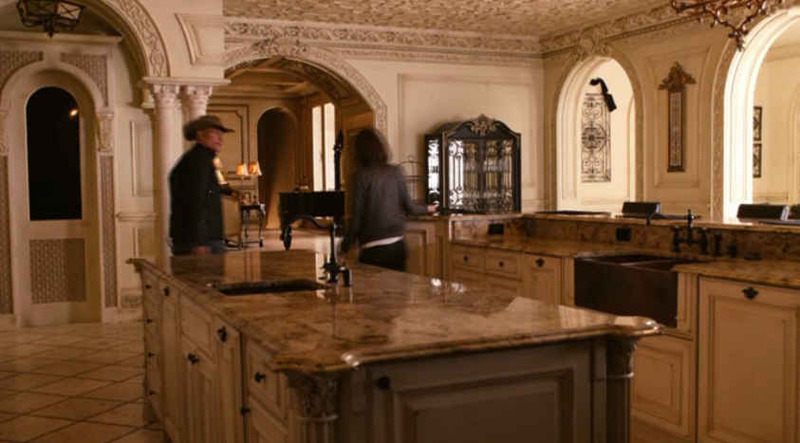 I’ve gotten a lot of requests to see photos of the kitchen from this movie. 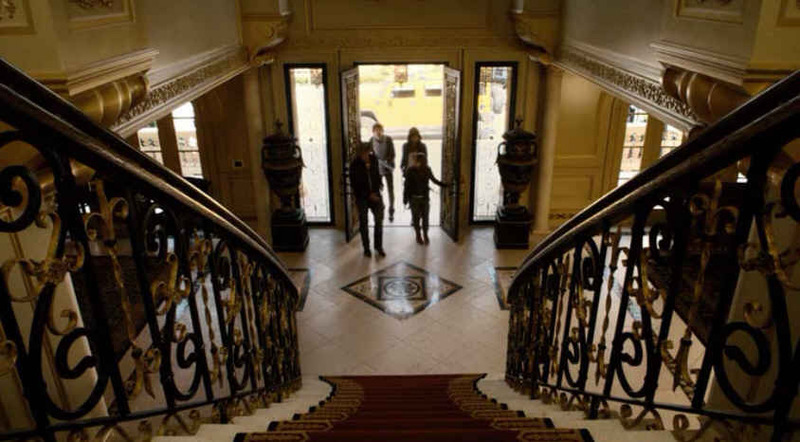 The house has 9 bedrooms and a whopping 13 baths. This was Bill Murray’s bedroom in the movie and — surprise! — when they arrive, he’s in it. Murray has survived so far by disguising himself as a zombie. You can see more photos and information on Trulia. The Beach House from Joan Crawford's "Mildred Pierce"
Great post and I love seeing movie houses, Julia. Too cold and way too big! Well, it’s big enough for any family reunion!! 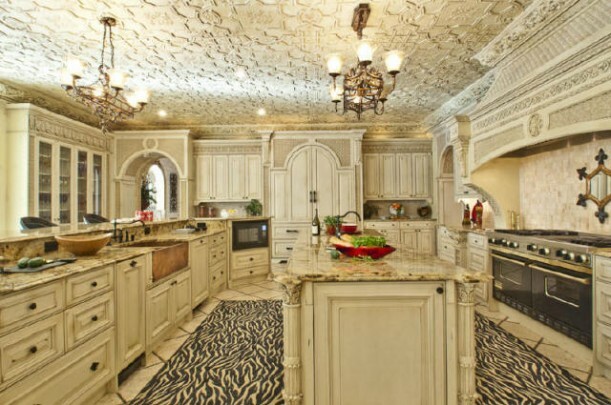 I don’t care for the kitchen ceililng or rug, but the rest I do like. Like you, it’s all about the outside, it’s beautiful. For my tastes, and I can be pretty mansion loving, it’s too big. I wonder how often anyone really lives there? My opinion about big poopa, I mean poppa? Better left to the imagination! I saw this house on MTV cribs. There is a full salon, tanning bed, massage room, recording studio and tons more shown. 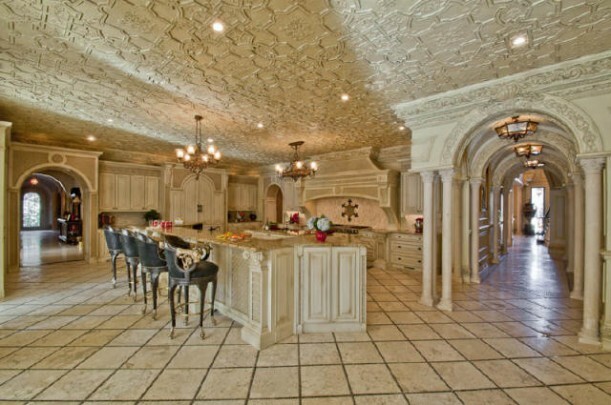 Can’t imagine making a cup of tea in that kitchen – too baronial. I’d run for Meg Ryan’s house on Martha’s Vineyard – it was in Elle Decor, I seem to recall, and was divine. 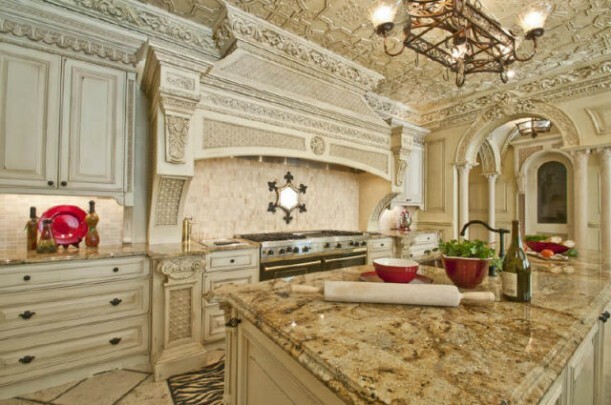 I would feel pretty darn silly making banana bread in that kitchen! The angle of those pics make the rooms look cavernous. Sorry, but EWWWWWW! I don’t like a single thing about this house. The interiors are just so tacky. If I had to pick one word to describe the place, I’d probably say it was offensive. And oddly, it didn’t look nearly this bad to me in the movie. This is so over the top I feel like I’m Harlen and Grace just did my my NYC apt. But for the money I’m still at the Doheny Estate. Wow, this house is way too big and luxurious for my taste. I like some things about it, but I just couldn’t live here. The house wouldn’t feel like home. I’m actually overwhelmed by this place. It’s huge! I can’t imagine decorating it becasue of both the size and the style! 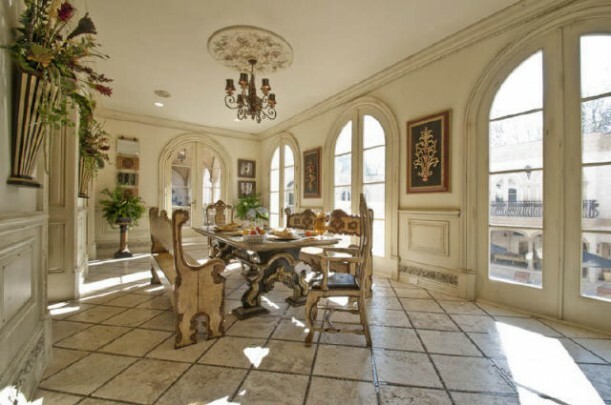 The house is pretty over the top, but well played as a choice for a movie star home. I find most of this house and it’s interiors just tacky, tacky, tacky. But, whatever–different strokes for different folks. Creepy — really a Zombie House! Couldn’t live there. 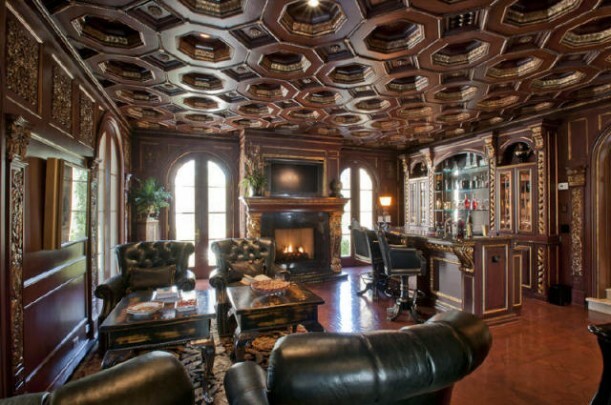 Weird ceilings. Gross reptilian textures on the ceiling. Cave-like. HATED IT……..It is poorly designed and overly wrought. Personally, the person that buys this house is insecure and buying it for the showoff factor. Not an indiviual that I would want to count as a friend. The only value in this home is that it shows the craftsmanship of the various trades. I bet they were laughing all the way to the bank. We don’t live too terribly far from the house. A friend of mine, who rides by it everyday to work, said that the new Three Stooges movie is currently being filmed there. If you look close, when they are outside dumping Bill Murray’s body you can see it snowing. The scene was filmed on March 1st or 2nd, which ever day we had a snow storm. Just funny how it was supposed to be Hollywood and it was snowing. I have been out there before when they were having the wildfires and the ash made it look like it was snowing. Can i be in the next Movie as a stand by? That Castle is Beautiful!!!! This is, in my opinion, an extremely ugly house. I do not like all the ornateness throughout. The outdoor space is definitely fantastic, but I don’t really care for the rest of the house. 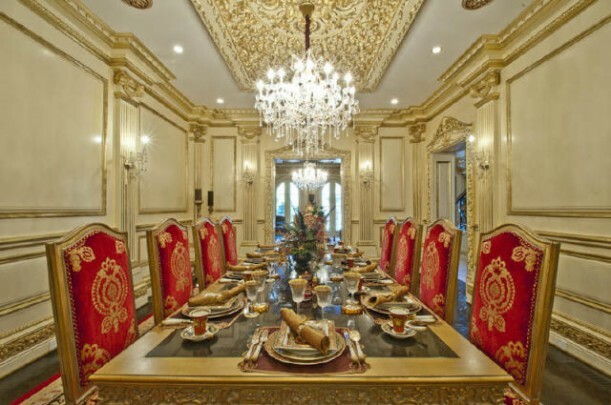 I don’t really like homes this formal anyway, but this one took it to the point of being gaudy. I do like the countertops and cabinets in the kitchen, but they went way overboard with the space. To each their own though, I guess. Is this the same house used in Toby Keith’s video “Who’s your Daddy?” Maybe not but that’s a fabulous house too… Know anything about it? Here is the link to the video. I love everything about it except the ceilings – the ceilings are just too much, would make me feel like the sky was falling. There has been a lot of unsual activity regarding Bill Murray lately, and chatter has risen from out of attentive people. From out of this chatter, has begun a rumor mill. From within that mill, are stated possibilities that Bill Murray is dying. The truth is desired, and even advisable before this “mill” creates something that is not. Please forgive my opinionated nature, but I will honestly state my own belief that it would be cruel for Mr. Murray to shrug the affections of so many, by just disappearing without a so long or farewell. There is a campaign to have Bill Murray attend a Halifax film festival in his honr. Facebook has one to have Bill Murray as the best man at a wedding. Bill Murray, I keep hearing about what a great person you are. Are you? If it is so, please put action into those words. If you are dying, please do the right thing. Say goodbye before you go. They could have used that house as the castle for The Princess Diaries. 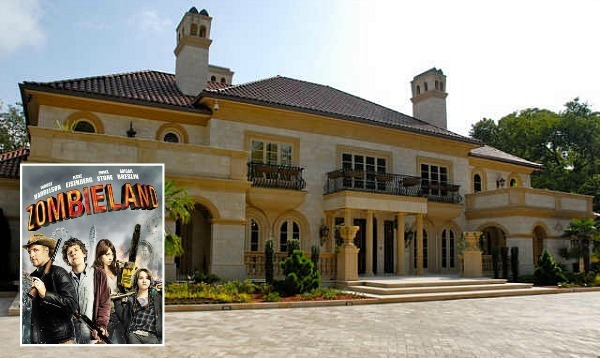 I am a back ground extra living here in Atlanta, I recently was in this house shooting the 3 Stooges Movie. I spent 5 days there and was all over the first floor main house as well as the pool area and what they called the “basketball court” building. The house is very big as you can tell by the pics but it is also very dark (in a medievil way) and depressing. I don’t know who designed this place but it seems as though “Jethro and Ellie Mae Clampett” got hold of “Jed’s” money and built this!!! My issue is that the kitchen, office and dining room are vintage-based yet the bathroom and bedroom are modern. No matter how large a home, people should pick and stick to one century through out! I too am concerned about his health. I have read rumours that he’s dying but I thought it was nonsense (like everyone else seems to) however i’ve been watching lots of interviews with him and it seems that since 2010 he’s been looking seriously ill – very pale and old (about 20 years older), drooping eyes. He also seems to have a chronic cough. If you look at all of his interviews from 2010 up until now, he’s coughing quite badly in all of them (Letterman, howard stern, cannes press conference…). It makes me feel pretty sad. I really hope he’s ok but it seems like a long term thing as he’s had it at least since 2010. He apparently joked with Ramirez that he was very sick. Well, everyone took it as a joke but it was probably true. Seriously, watch all of the interviews. It seems to be a respiratory problem. His voice is hoarse too. I wonder why he hides it. Is he scared of not getting roles because of it?